I was in Target a couple months ago to peruse the Sonia Kashuk (SK) collection & I spotted this hair brush. Have you tried any of her products? There are definitely some gems within her collection, not just in terms of makeup, but with her beauty tools, too. On top of having some beautiful makeup brushes, she also created some wonderful hair brushes. I remembered reading about her hair brushes in Allure magazine. It was rated as one of the top beauty buys & was also said to be on par with the coveted Mason Pearson (MP) hair brushes. Immediately my interest was piqued. 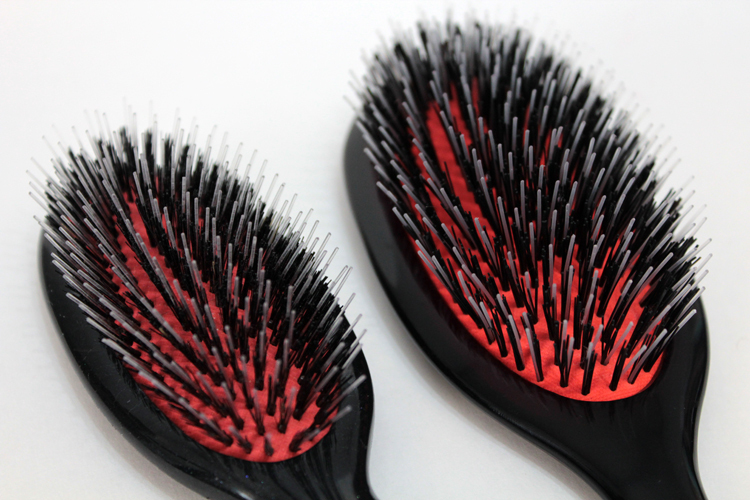 The SK hair brushes come in two sizes. I bought the smaller of the two so I could easily throw it into my purse for on-the-go touch ups. I have to say -- it performs remarkably well. Obviously there are a few differences between the handmade MP hair brushes and the mass produced SK hair brushes (aside from the price tag), but the similarities are uncanny. 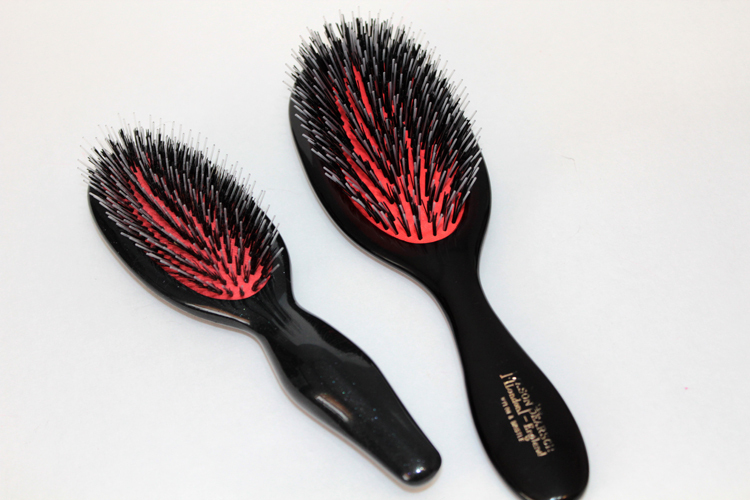 Both padded hair brushes have mixed bristles (boar & nylon) and they perform in a similar fashion, too. At first, I found the SK hair brush to be a bit stiff, it just didn't feel quite as flexible as the MP. Although, after more uses, I found both brushes to feel almost identical. The bristles run through my hair effortlessly. Detangles without tugging. Adds a subtle shine to my locks. Gently massages the scalp. Plus, despite the differently shaped handles, both hair brushes feel comfortable in the hand. 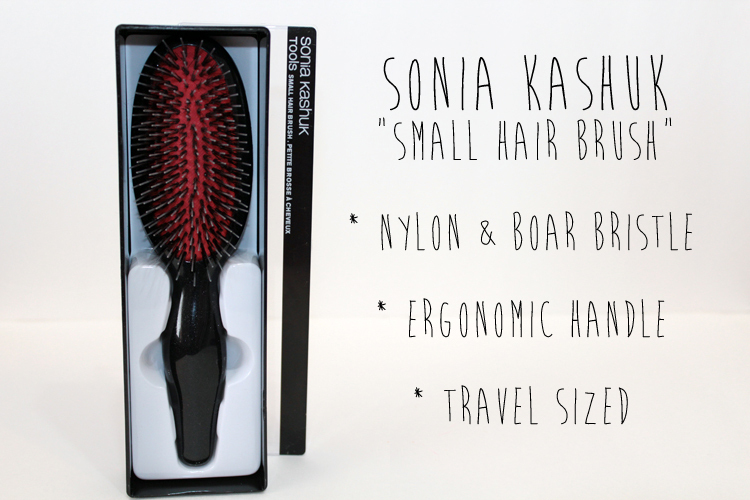 I’d highly recommend checking out the Sonia Kashuk brushes, especially if you’re not quite ready to dole out over $100 for a hair brush. The SK brushes retail for around $12 for the small version and $15 for the larger version. Ps, if you still want to pick up a Mason Pearson brush in Canada & you’re not sure where to look, I got mine from eBeauty.ca :). It comes in a lot of different sizes & bristle combinations. I bought the “handy” with mixed bristles. Mason pearson brushes are so expensive for a brush! I'm always scared to buy it and then be disappointed. I'm definitely gonna check out this dupe though. Didn't even know about it thank you!!!! Please, please consider boycotting Target. The workers of the Zellers stores that were bought out were not guaranteed jobs at Target - they were merely "given the chance" to interview for a position in which they would perform the same tasks and, in some places, work in the same building - with just a new coat of paint on the walls. Some of these workers had dedicated their lives to working at Zellers and enjoyed benefits that had been built up with years of service. These benefits have not been upheld by Target; in addition, at some locations, positions formerly offered by Zellers for people with mental disabilities have not been backfilled by Target. Please consider supporting these workers in their struggle to unionize and demand better treatment by shopping elsewhere. Can you please provide tips on how you cleaned your brushes? Much appreciated! Have a nice day! I am planing to buy the Mason Pearson Brush, but I really need to know if its worth it. I have fragile, thin n fine hair... I am considering all boar bristle. Your reply will help me making decision.